A new concept on human diversity has emerged over the past 10 years that promises to revolutionize the way educators provide services to students with special needs: neurodiversity. Just as we celebrate diversity in nature and cultures, so too do we need to honor the diversity of brains among our students who learn, think, and behave differently. 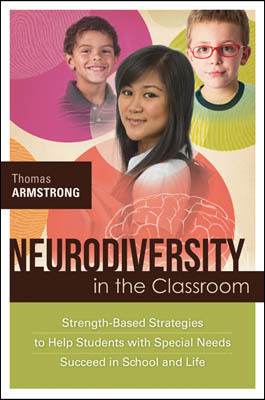 In Neurodiversity in the Classroom, best-selling author Thomas Armstrong argues that we should embrace the strengths of such neurodiverse students to help them and their neurotypical peers thrive in school and beyond. Timely information about how to integrate the strategies and assessments for each category with the Common Core State Standards. It's time that we focused on celebrating rather than pathologizing our students with special needs so that they can fully realize their potential in school and life. This practical and thought-provoking book will inspire teachers and administrators everywhere to make sure that all students with special needs get the support and strength-based instruction they deserve. "Thomas Armstrong captures the potential and power of disabilities. He cites many examples of the gifts and talents demonstrated by individuals who have disabilities. He also describes actions that educators can take to support students with a wide range of needs and transform teaching and learning for everyone." "As a counselor working with neurodiverse teens and adults, I know that often the majority of my work is coaching parents, teachers, administrators and employers on the strengths these individuals bring to the table. Neurodiversity in the Classroom goes a long way in helping professionals such as myself with this daunting task. Neurotypicals like us are the ones who need to ‘think differently’ – this book should be mandatory reading for all teachers." —Jan Johnson-Tyler, Founder & CEO of EvoLibri Consulting, Santa Clara, Calif.
"In Neurodiversity in the Classroom, best-selling author Thomas Armstrong continues to present concepts that stand to revolutionize the way students with learning disabilities are taught and thought of by educators… This book thoroughly describes the new concept on human diversity, neurodiversity, and it provides easy, practical strategies for educators to implement in their classroom that will help students’ with special needs to focus more on their strengths while still working to improve their weaknesses." —Cindy Lumpkin, Special Education Lead Teacher, Atlanta, Ga.
THOMAS ARMSTRONG has been an educator for the past 40 years. He worked for several years as a special education teacher in the United States and Canada, developed courses in human development for colleges and universities in the San Francisco Bay Area, and served as an educational consultant for schools in New York State. For the past 26 years, he has been an author, keynote speaker, and workshop leader in 43 U.S. states and 18 countries.